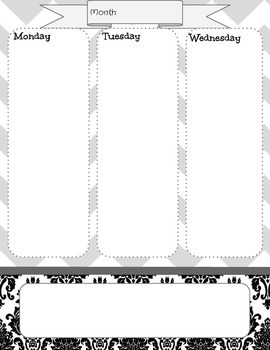 This is a weekly day planner for teacher or student use. Each week spans two pages. You may print off 52 copies (1 per week), double sided, and put them into an duo-tang or add your own cover by comb binding. The cute chevron and damask pattern looks great when photocopied in black and white. It includes a section for weekly learning goals and another for notes and looking ahead. Stay organized and prepared with this great freebie!